It can’t do a carafe like Keurig 2.0 and it doesn’t have a built-in milk frother like $179.00 K-Cafe, but it’s still one of the best Keurig coffee makers money can buy (and you can usually get it for around $90!). Why it’s so popular? Because it’s basic and simple to use. 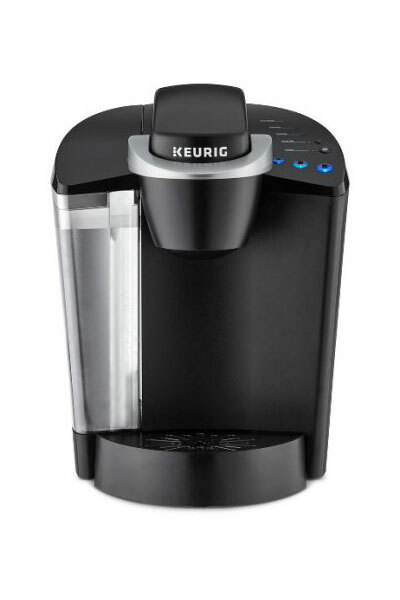 As a basic k-cup brewer, Keurig K55 is very simple to operate. Instead of a delicate touchscreen, there’s one power button and 3 buttons to choose cup sizes: small, medium and large. The K55 works with all brands of k-cups and allows you to make all kinds of drinks. The machine has 48-ounce removable reservoir. That’s enough to make 5 standard cups and it’s really easy to refill. You can either remove the reservoir or simply lift the lid on top, fill it up and close. The drip tray can also be removed to fit travel mugs. This model does not have the auto on feature so you can’t set it to brew at the specific time, but there is an auto-off option. Keurig K55 is available in two colors – black and rhubarb and retails for $119.99, but you will most probably find it on sale on Amazon. When you press the Power button, K55 takes approximately 4 minutes to preheat. But, this preheating is a one-time process. Once heated, the machine allows you to make several cups one after another. After it’s done heating, the red Heating light will turn off and the brewer is ready to make coffee. Get one k-cup of your choice, lift the handle, insert the k-cup and close. Choose your desired cup size (small 6 ounces, medium 8 ounces or large 10 ounces) and press the button. That’s it! On average, it needs 60 seconds to brew 8-ounce cup of coffee. When done, get out the empty k-cup and you can make a new one or simply enjoy your coffee. Here you can download Keurig K55 manual. This is a classic series brewer and doesn’t have a scanner, so it’s compatible with all regular k-cups: Keurig branded and non-branded, k-cups with updated or old labels. If you want to use your own coffee, there is also a reusable k-cup filter for K55. Keurig K55 is not compatible with k-mugs, k-carafe pods, Vue cups, Verismo pods, Nespresso or the CBTL pods. But, you can make all sorts of drinks using regular k-cups including iced coffee or salted caramel mocha. The K55 includes a limited one-year warranty for normal home use. Customer service help is available 7 days a week at 866-901-2739. It’s recommended to clean the external parts or the brewer regularly using a wet cloth and descaling your machine every three to six months. The water filter should be changed every 2 months or 60 tank refills. Here’s a step-by-step guide on how to clean your Keurig. It’s easy to recommend Keurig K55. It’s convenient and has all the basic options you might need. Works with all k-cups and allow you to use your own coffee too. The design is pretty good and will fit almost any kitchen. My mini delivers various volumes of coffee. I always use the same 10 oz water measure and the same mug and same pod from the same box. Results are not consistent strengths. I have done ALL of the cleaning processes.